Join Swagbucks! The Carnival is Here! Hey there. You haven't joined Swagbucks yet? I have earned enough Amazon Gift Cards to fund a few giveaways so I can't say enough good things about it! On top of how easy it is to use, I love the bonuses and fun things that they come up with to keep their users engaged. The latest promo? The carnival! You can earn bonuses by meeting the daily Swag bucks goal. It looks like some of us need a little extra motivation to get out there and earn those Swag bucks! Here's a quick run down from one of The Swag Guy himself, Hal. 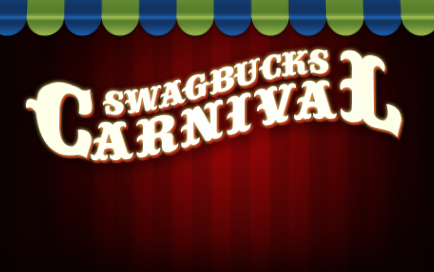 The Swagbucks Carnival has started, and it gives you an opportunity to earn bonus Swag Bucks each day just for earning the way you normally would. Check the meter on your homepage and you'll see you daily goal and how close you are to hitting it. Every day you hit the goal, you add to your bonus! As if that wasn't enough, you'll get additional bonuses based on how many days of the Carnival you're able to hit your goal! To top it all, Swagbucks is having a Swag Code extravaganza on Monday - that means lots of codes, lots of Swag Bucks and lots of fun! Don't miss it!" Don't miss out, friends. I'm glad I joined when I did and I'm sure you guys will be as well. See you there! Later! Wish they have another one soon!